I am eternally grateful for the ability to be “wowed” on a continual basis when I see works of art/artists I’ve never seen before! This may just be the art historian nerd in me, but I think anyone would have to admit that Miyashita Zenji’s ceramic works have a major “wow factor.” Once again, I present you with a Japanese ceramic artist who continues the incredibly rich and millenia-old history of Japanese ceramic art. There were two schools of thought among ceramic artists in Japan after World War II (1939–1945). One group emphasized the continuation of the venerable, centuries old traditions in stoneware, earthenware, and porcelain that began with some of the earliest decorated ceramics in the history of Earth. Another group came out of Nitten (Japan Art Exhibit) in 1946, which advocated exploration of western styles and new techniques. The Nitten group eventually led to the establishment of the Association of Modern Artist Craftsmen (their word, not mine, because Miyashita’s works are not “craft”). This group in turn spawned numerous groups that explored avant garde styles in ceramics, and by the 1950s had moved modern Japanese ceramics from the impetus of purely “works for use” to “works for contemplation.” Miyashita’s mature art evolved out of this fertile atmosphere in Japan of the 1950s. While growing up, Miyashita decorated porcelain with his ceramicist father Miyashita Zenju. He later studied academic ceramic art, but in the early 1950s he was eventually drawn to the offshoots of the Nitten group that looked outside of Japan for modern trends in ceramics. He won 18 exhibitions with the group throughout the world. His mature style had evolved by the early 1970s when he began producing stoneware works of art in multi-colored layers. The artist used a colored clay (saidei) technique in which light-toned clay is colored with a variety of natural stains. Miyashita applies these extremely thin layers of clay in irregular bands to cover the surface of each vessel. Ranging in gradient tones from deep purple to faint pink or from dark blue to the palest green, these layers transform into distant hills, drifting clouds, or rolling waves. A look at the interior of Miyashita’s vessels reveals the very thin layer strips that form the outer design. On the exterior of the vessel, each layer has a very slight, thin ridge, which adds a three-dimensional quality to the pattern. Miyashita’s designs are truly meant for contemplation, because I would hate to ruin a beautiful vase like this by sticking flowers and water in it! It’s sculpture! Studio Activity: A layered clay experience. Form equal-sized, thin square sheets (about 6” x 6”) of three different colored clays. 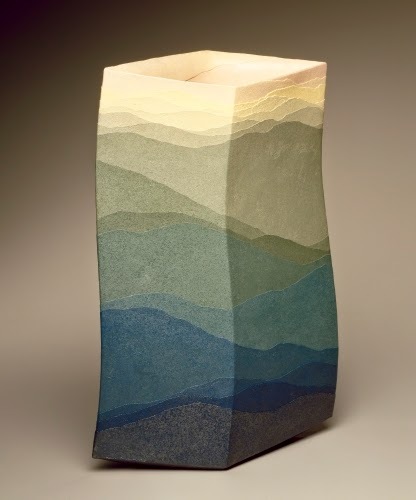 Using a plastic knife (like one used on a picnic) or wooden clay carving tool, carefully cut into each layer, making sure not to disturb the layer below it, and create a design, either a landscape, seascape, or abstract design, in which all three colored clays are revealed. Either smooth the finished edges into each other, or leave a slight ridge to mark where one color begins and the other ends.